Firstly a reminder - I will be at Pop Gallery Orlando TOMORROW NIGHT - Downtown Disney here in Florida - 7pm until 10pm - FREE event (no tickets needed) - the launch party for my "Myths and Mermaids" Oracle Deck. Both my sisters (co-authors) will be there too, to autograph the new deck & chat & celebrate! - come on by - details areHERE - I'll have lots of other art (statues, prints, jewelry, original paintings, books, etc.) too. Two new Disney paintings of mine have been released - "Evil Queen" and Haunted Mansion's "Tightrope Girl" Mark your calendars - these images and my other WonderGround Disney work will be coming to Florida's Disney Marketplace Co-Op - and I will be there for a special event November 7&8th. Eight and Sand Gallery's "All Hallows" show is now up online (and in Seattle at the gallery, if you live close!) 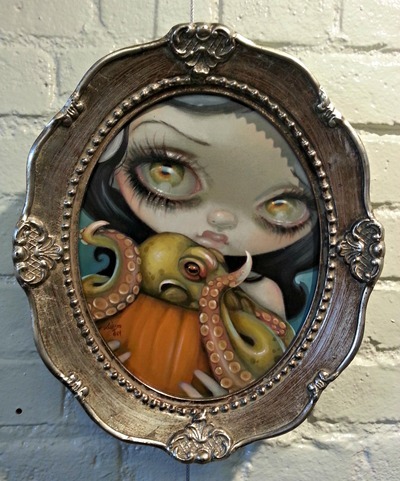 - my original painting "Octopus Pumpkin" is now available online HERE. Speaking of the gallery in Seattle - I will be having a solo show called "Birds and Beasties" next October, 2015 -details are HERE. Vacation Alert: We leave for the UK early next week so my Strangeling eBay store will be in Vacation Mode soon. All orders paid before Monday morning will ship before we leave. All other new payments or new strangeling.com website orders will ship upon our return, November 5th. Live in the UK? I'll be at the Avalon Faery Fayre October 25-26 in Glastonbury - details are HERE. The following weekend (Saturday & Sunday on - November 1-2) I will be in Whitby for Whitby Goth Weekend - details are HERE. Available only through WonderGround Gallery at Disneyland (and soon to be also at Disney's Marketplace Co-Op here at Disney World in Florida), worldwide shipping. Email merchandise.guest.services@disneyparks.com or call Merchandise Guest Services number at 877-560-6477 (option 2) or (714) 781-4565 – they open at 10:00am Pacific Time - they are happy to ship worldwide. Available as matted prints, limited edition framed signed canvases, mini framed canvases & postcards - ask the representative at the phone number above and they will let you know what is available! The original painting SOLD at the show. This image will also be available soon in Florida at the Disney Marketplace Co-Op on the Marketplace side of Downtown Disney / Disney Springs here at the Walt Disney World Resort as well, so if you live in Florida you should have options to purchase in person soon too. I will be there in person at the Co-Op the evenings of November 7 & 8 from 5pm-7pm. One of the pieces I painted for Disney that debuted at the WonderGround Gallery in the Downtown Disney® District at the Disneyland® Resort in Anaheim, CA. Licensed & contracted by Disney, ©Disney, this is my original acrylic painting featuring Disney’s Evil Queen from the animated film “Snow White and the Seven Dwarfs”. Snow White and the Seven Dwarfs is one of my favorite Disney classics. When I was a kid, I remember my grandmother telling me that she saw it in the theatres when she was a little girl, which totally blew my mind! The Evil Queen is such an archetypal character; she helped define my notion of a true "villain." She is beautiful, vindictive, fabulous, but incredibly powerful - juxtaposing petty jealousy with supernatural thrill. One of the most unforgettable scenes has to be her consultation of the mystical servant in the Magic Mirror (who I find creepy even to this day). 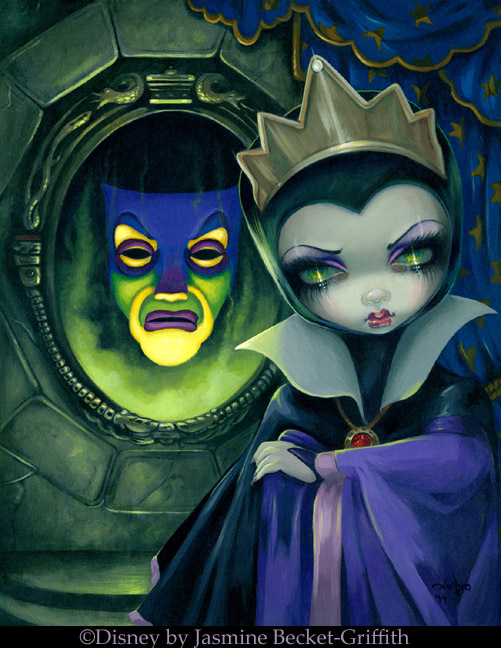 I have painted my interpretation of the Evil Queen in my usual stylized characterization, an acrylic painting capturing the mood & mystery of her conversation with the Magic Mirror. Prints, merchandise and limited edition canvases are available exclusively through Disney. More details are here. One of the pieces I painted for Disney that debuted at the WonderGround Gallery in the Downtown Disney® District at the Disneyland® Resort in Anaheim, CA. Licensed & contracted by Disney, ©Disney, this is my original acrylic painting featuring Disney’s "Tightrope Girl". This piece is inspired by one of the most iconic scenes in one of my all-time favorite Disney attractions - The Haunted Mansion! The infamous room that houses the stretching portraits left a huge impression on me as a child - a true piece of Walt Disney Imagineering magic. The delightful creepiness of the character known as the "Tightrope Girl" speaks to me in particular, and as a Florida girl, I identify with the alligator-based narrative. In my interpretation I have painted her as a tall, narrow acrylic painting to keep the general aesthetic of the portrait in full "stretch." Keeping with the Southern Gothic feel of The Haunted Mansion in New Orleans Square at the Disneyland® Resort, I have expanded the atmospheric background into an immersive Louisiana swamp, and of course the character herself has been given my personal treatment with the larger head / big eyes painted in the pop surrealist/Jasmine Becket-Griffith style. From the "All Hallows" show at Eight and Sand Gallery in Seattle! You can visit her in person at the gallery, or you can purchase the original painting now online here. Prints & Lt. Ed. Canvases also available here. Seattle folks - mark your calendars for 2015 - October 10th - that will be the opening for my solo show next year at Eight and Sand. My official event page for the show ishere - more details will follow! My next Oracle Deck "Myths and Mermaids: Oracle of the Water" is up for pre-order now at Amazon! Click HERE to see! We'll be having the official "launch party" on October 18th at Pop Gallery at Downtown Disney here in Florida (details are HERE), both my sisters Amber & Kachina (authors of the book for the deck) will be there too to sign autographs, etc. Amazon is shipping much later, so those of you who come get it at Pop Gallery on October 18thwill be getting it much sooner! Can't make it in person? If you call the gallery - (407) 827-8200 - they can snag a signed copy at the show & mail it to you afterwards (signed by me & both my sisters - and yes, they ship worldwide!). This deck focuses on Water - the sea, mermaids, mythologies of water, sirens, nymphs, sea creatures & more. Stay tuned early next year for my other upcoming decks - "Fairytale Oracle" with Lucy Cavendish, and "Beautiful Creatures Tarot" with JR Rivera!